It's probably fair to say that the recent changes made to the Misuse of Drugs Regulations by the Department of Health came as a bit of a surprise to everyone. They take effect from 4th May 2017 and are summarised below as per PSI guidance. The 2017 Regulations are not yet available on the Irish Statute Book but in the meantime an unofficial draft of the Regulations and details on the commencement of the regulations is available on the Department of Health website. the name of the controlled drug (required to be handwritten). This can be either the brand name or the generic name of the drug. The benzodiazepines previously found in schedule 4 of these Regulations are now found in a new schedule 4 part 1 of the new 2017 Regulations. The “z-drugs” zopiclone, zolpidem and zaleplon are now subject to control under the Misuse of Drugs Act and will also be listed in schedule 4 part 1. One of the most significant effects of the new Regulations, in relation to benzodiazepines and z-drugs, is that the restrictions in place on the possession of controlled drugs will now apply to these medicines. A form of controlled drug prescription will also be required for these medicines. 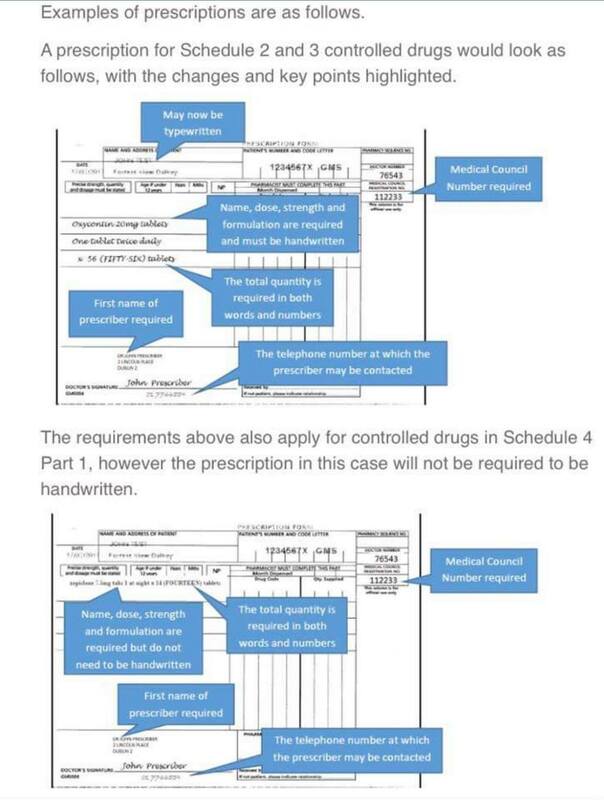 Prescriptions for drugs in schedule 4 part 1 will not have to be dispensed within 14 days of the date they are issued on the prescription and may be repeated. Pharmacists will be required to keep a copy of all prescriptions and any endorsements made for drugs in part 1 of schedule 4 for two years after the date of supply and mark prescriptions accordingly. Pharmacists are also required to keep a copy of this record of dispensing made on the prescription. Prescriptions for drugs listed in schedule 4 part 1, issued before the 4 May 2017, shall continue to be valid. Prescriptions for all controlled drugs issued after this date must comply with the new prescription requirements.